What It’s About: Successful singer Bob Wallace (Bing Crosby) teams up with tap dancer Phil Davis (Danny Kaye) after they demobilize from World War II, and they develop a hugely popular touring musical revue. But after the men become infatuated with a pair of singing sisters (Rosemary “aunt of George” Clooney and Vera-Ellen), they find themselves in Vermont. They try to help an innkeeper (who just happens to be their former general), whose resort is struggling from lack of snow, by staging a major show at his inn on Christmas Eve. Why Watch it Today? : It’s Christmas Eve! Prepare for the holidays and let the singing and dancing quartet do your “snow dance” for you. You’ve probably heard the title song a million times already, as it was the best-selling single of all time (according to Guinness Book) and Crosby’s Christmas record has never been out of print. The film can claim additional sources of interest, though. For one, it was the first film in VistaVision, a technique that used horizontally-oriented film to create a higher-quality image, and thus presaged IMAX techniques. White Christmas was also directed by one of the most successful studio directors of all time, Michael Curtiz, who also directed Casablanca and seemingly every Errol Flynn film ever (The Sea Hawk, Captain Blood, The Adventures of Robin Hood — which features fight scenes with musical-worthy choreography). The cast is fantastically talented, with the vocal chops of Crosby and Clooney matched by the excellent dance moves of Kaye, Vera-Ellen and John Brascia. As you might expect from a film starring one-half of the duo behind the Road To… series, there’s also a healthy dose of comic talent to go around. As musicals go, it’s preposterousness rating is low: a plot centering on professional singers and dancers makes for plenty of opportunities for singing and dancing in appropriate contexts (performance, rehearsal, composition), as opposed to, say, the Saigon airlift. Speaking of which, apparently the secret signal for Americans to evacuate Saigon was… the song “White Christmas.” Learn something every day! 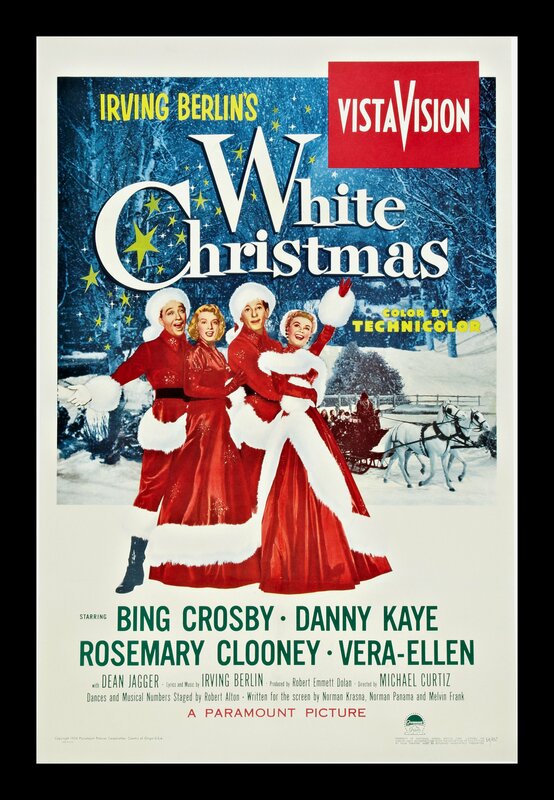 The video clip below isn’t particularly Christmas-y, but suggests some of why this is just a great Fifties movie. Enjoy. This entry was posted in Buddy Flick, Holiday, Movie of the Day, Music, Musical, Romance and tagged Bing Crosby, Christmas, dance, Danny Kaye, drag, Irving Berlin, Michael Curtiz, minstrel, musical, revue, Rosemary Clooney, Vera-Ellen, Vermont, VistaVision, World War Two, World War Two Veterans.